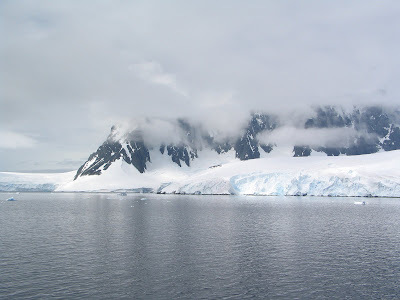 We boarded the Laurence M. Gould for our journey back on December 23, 2006. Going back through the Gerlache Passage was even more exciting and beautiful than coming the other way. 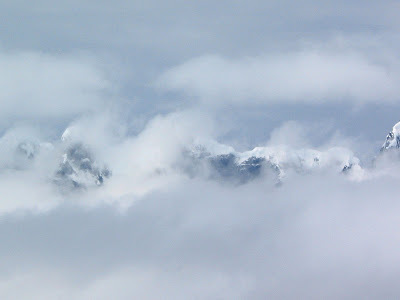 If you look back towards the beginning of the blog, you can see the brilliant day that greeted us in Antarctica. On the way back the day was overcast, with mysterious lines of clouds clinging to the mountains on either side of the passage. I couldn't put down the camera , or if I did, it was to pick up the video camera. I could barely grab a sandwich! As the ship turned away, Palmer Station seemed to fade into the distance. But no sooner was it gone when suddenly the scenery was utterly compelling. We saw whales numerous times, although none with the Canon digital. This combination of granite and fog, ice and water was more mysterious than any landscape I had ever seen. Only the photos of Wang Wusheng come even close. Usually it didn't look sinister but that first picture reminds me of the pilots I have known who joke about granite clouds. The changes happened fast. Focusing on one point sometimes yielded several different photos, both because of the motion of the ship and also the movement of the clouds. 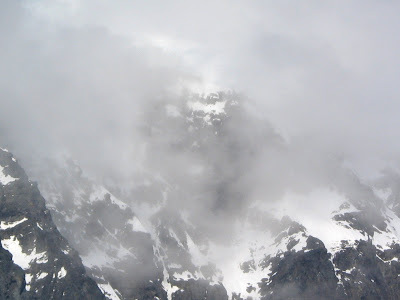 The scale of the mountains is not terribly evident in these small photos. But I estimate the cliffs as 30 to 75 meters high. Late in the day we passed Smith Island. Antarctica was retreating in the distance. The low angle of sun had us seeing night for the first time in nearly two months. I wondered how I would react, but I slept so soundly, it was a relief. We had an almost endless sunset that went on for hours. Here is mate, Larry Brissette at the controls. Since there were only five passengers on board, the crew invited us to be in the bridge. Art and I took them up on their offer and spent a good deal of time talking and watching the navigation process as we crossed the Drake. It was so smooth that they were calling it Drake's Lake! Lucky, because we had talked to passengers on a cruise ship that moored at Palmer and they had encountered 10 to 15 meter waves. A part of me would have liked to experience something like that, but the prospect of being tied to my bed for three days was not too appealing. This is how we celebrated Christmas Day. Captain Scott Flanagan gave us a "safety demo" by shooting of flares and letting us shoot some off the stern of the ship. 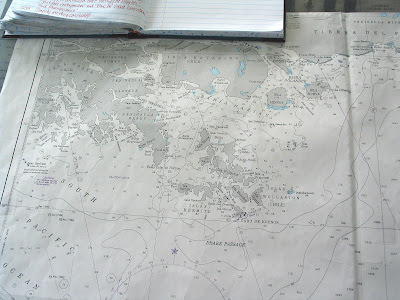 This is the chart and log as we approached Cape Horn. We continued up the Atlantic coast of Tierra del Fuego, Argentina, to the mouth of the Straight of Magellan. Once inside the straight, we met the pilot who guided us into port at Punta Arenas. 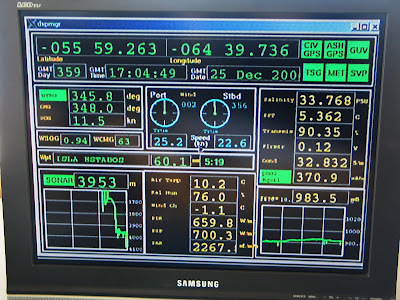 Somewhere in the Drake Passage I snapped this picture of the ship board computer screen. It was Christmas day, day 359 of the year, 17:04 GMT. Our position was at 55+ degrees South latitude, 64º west longitude. We were headed almost due north 345º with a bearing of 348º, making 11.5 knots of headway. The wind was coming from the due north at 25 or 22 knots (different gauges). Our heading is toward Isla Estados. The salinity of the water was 33.7 (not sure the units), Water temperature was 5.362ºC (up at least 5º from our departure at Palmer.) Depth is 3953 meters (more than 10,000 feet!) Air temp is 10.2ºC. Relative humidity 76%. Wind Chill -1.1ºC. Barometric pressure measured 983.5 millibars. 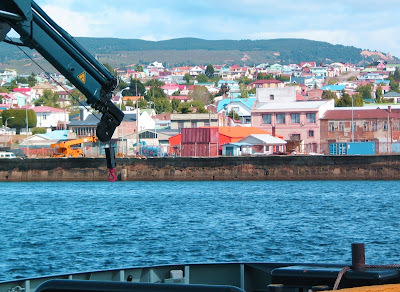 Here is Punta Arenas on our arrival. I was overwhelmed by the color. Just seeing green trees was an intense experience. I like Punta Arenas. 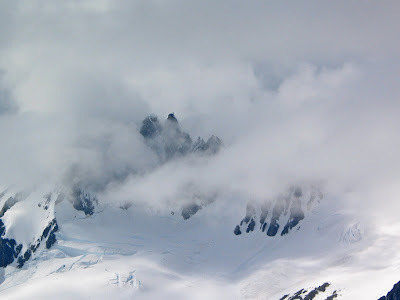 It is a stopping over point for many outdoor treks and the town is full of camping stores like North Face and Patagonia. (This is Patagonia, after, all.) Maybe someday I'll come back and explore South America from here. I have a lot to say about Antarctica, what I saw, what I learned. I'll be posting form time to time about the progress on my work in the studio. I hope to display the cast glass along with the photography and video and perhaps some cast ice, as well. I'm just looking for the right venue. I'd still like to post my thoughts on the vast visual input of my ice studies. Another might tackle the implications of global climate change and the vast re-ordering of the earth which is happening under our feet. I'd like to especially than the National Science Foundation for making this magical voyage possible, along with their contractor for Antarctica, Raytheon Polar Services. Everybody was wonderful and more than helpful. I saw more, accomplished more than I ever could have imagined. Some of your comments that were posted also deserve a response. I didn't take full advantage of the blog format, but what a blast this has been! Go Blogger! If you wish to contact me, please write druth@glass.com. I'll try to answer all questions. No questions, just kudos. I feel like an armchair traveler on your adventure. I presume you're back home now. Welcome back to the States and Happy New Year. What an awesome journey! Thank you so much for sharing and for taking us (me) along! Please leave this blog up: I haven't been able to take in the full journey yet (not all the stories and posts), but definitely want to and will over time! Those are some awesome pics. Unfortunately most people don't care for the beauti of nature these days. David I was rivetted by your blog entries. What an amazing adventure it was. The way your shared the experience with your photos, your gift at explaining things and sharing what it was like, your passion for what you love and also what is in your heart came through. I just loved it so much and I hope it stays here to see for a long long time. I'm very interested in any updates and any other adventures you might go on. I wish you all the best in all you do, and hope to see more of your blogs in the future. Very interesting ! I am proud of people doing things like that ! DID YOU KNOW?... Antarctica was originally called Penguin Town!!! Awesome blog. Really neat. Congrats on your 'Blog of Note'. You had a great opportunity for a really cool experience! Looks like it was awesome! I hope you can give me some advs in my blog. well, good scene..wonderful experience work at there.. Welcome back on front of Blogger! The photos are beautiful and the descriptions very informative. 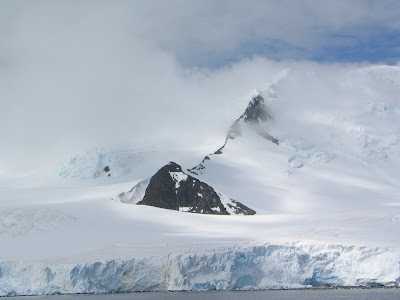 I would love to visit Antartica myself. If you guys do a book or a DVD, put me on the list to buy one! Cheers! Wow! I just stumbled upon your blog and what an amazing journey you've been on! I would like to thank you for sharing your experience; I felt like I was right there with you! Thanks again and I wish you success in all of your future journeys! Great blog, my screen feels kind of cold when I visit it. Very COOL! 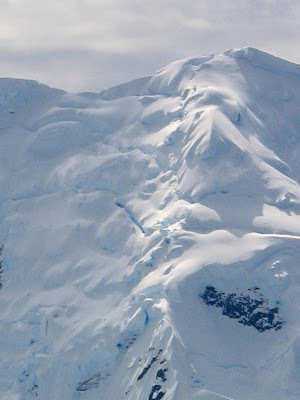 I want to do my masters in Antarctica. Do they offer such a thing? Un saludo desde Concepción, CHile. Oh gee ! I envy you people. Wish I could be in your shoes. Anyway it is a beautiful place. We had our people making it to the North Pole and to the South Pole too. Awesome blog with excellent photos! What an adventure you guys are having!!! Hello, can you add me to your links? Thank you for your wonderful record of your time with the penguins, seals and ice. It made me shiver just to peruse through your adventures. This is brilliant. It has been many years since I visited the continent. I very much enjoyed all your photographs and post. thank you for taking the time. Wow you have an exciting life! I won a CD instead. I heard you could go swimming there...that would be fun! What an awesome thing to say - "I went swimming in Antarctica!" WOW!! Breathtaking photos!! Thanks for sharing you adventures and your photos. Just stumbled onto your blog through Blogger's "featured content" link list. The pictures are beautiful, and I wonder if you've considered submitting them into contests? Would like to come back at a later time and hear more about your work and travels to Antartica. Those, sir, are some extremely beautiful pictures. Thank you for sharing! Great blog with great pictures. Looking at them, I realize that one get more familiar with the site watching photos posted in a blog than watching the same at Natgeo or Discovery channels. Why? Check out my pics at my blog. Awe inspiring pictures and an awe inspiring journey. Wishing you all, the very best. We are fortunate indeed to live on Dartmoor, one of the last great protected wildernesses so we have a vested interest in protecting the planet. Came to your blog looking for hope and ispiration - certainly found it - your text is vivid and images breathtaking !! Our blog is a gentle unravelling of the seasons beauty as they change on the moors - a postcard for posterity. Awesome! I am myself a snow lover. Your blog gave me a chance to see and learn, what i am missing. It was great following your trip. I hope everything is well with you. Beautiful pictures. Never thought that it would look this nice. It's amazing of what travelling has to offer.